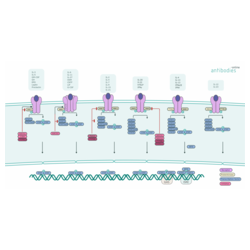 JAK-STAT signaling in vertebrates relies on a network of protein kinases and transcription factors to integrate signals from various receptor systems. The multitude of stimuli include cytokines, growth factors, and hormones, binding of which ultimately effect processes such as immune response regulation and cell growth, survival, and differentiation. Binding of the ligand to the receptor triggers conformational changes of the receptor molecule(s). This steric change of the receptor brings two Janus Kinases (JAK) bound to the receptor or receptor subunits into close proximity, thus enabling trans-phosphorylation. The activated JAKs phosphorylate subsequently additional targets. The major phosphorylation targets are Signal transducer and activator of transcription (STAT). These transcription factors are inactive in the cytoplasm until phosphorylation by JAKs. Once the a conserved tyrosine toward the C-terminus of the STAT has been phosphorylated, it can acts as dimerization interface in conjunction with SH2 domains of another STAT. These activated STAT dimers are then translocated to the nucleus and bind to specific DNA motifs to activate target gene transcription. Suppressors of cytokine signaling (SOCS) gene transcription is stimulated by activated STATs. SOCS inactivate signaling through binding to the phosphorylated JAKs or receptors or facilitate JAK ubiquitination. Protein inhibitor of activated STATs (PIAS) bind to activated STATs and prevent them from binding DNA. Protein tyrosine phosphatases (PTP) reverse the activity of JAKs. The prototypical JAK-STAT signaling pathway is rather linear. 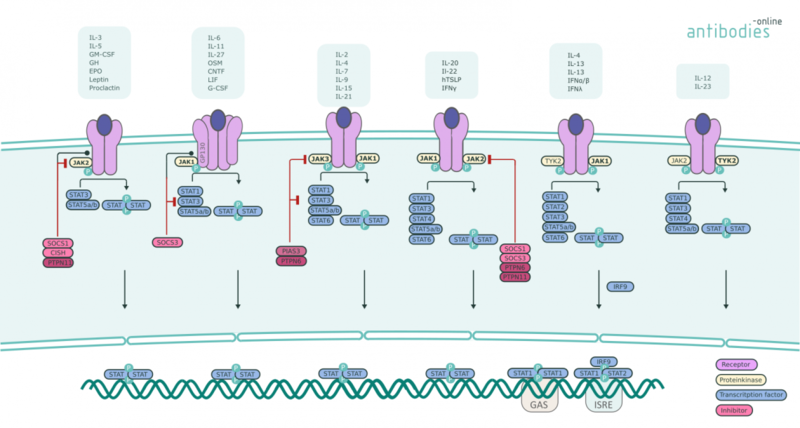 There is however considerable crosstalk with other signaling cascades like MAPK pathways and JAK independent STAT phosphorylation through receptor tyrosine kinase (RTKs).